In less than a week, NASCAR Xfinity Series driver Spencer Gallagher experienced the highest of highs and the lowest of lows in his racing career. 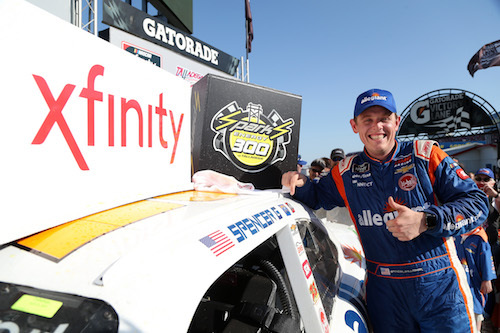 After leading his first lap in series competition, the final lap of Saturday’s Sparks Energy 300 at Talladega (Ala.) Superspeedway, he claimed his first-career Xfinity Series win. But on Wednesday, an announcement came from NASCAR that he has been indefinitely suspended for violation of the sanctioning body’s substance abuse policy. Gallagher has agreed to participate in NASCAR’s “Road to Recovery” program in an effort to get reinstated. As an Xfinity Series regular, Gallagher’s win made him one of the four drivers eligible to race for the fourth and final Dash 4 Cash $100,000 bonus of 2018 on May 5 at Dover (Del.) International Speedway. Other drivers who qualified for the Dover bonus, as a result of their Talladega finishes, included Brandon Jones, Justin Allgaier and Elliott Sadler. Ryan Sieg, who finished sixth at Talladega, is expected to replace Gallagher as a Dash 4 Cash driver for the Dover race. A substitute driver fro the No. 23 GMS Racing team for Dover will be announced later this week. Saturday’s Xfinity Series race at Talladega was Gallagher’s 49th-career start in the series. He also has 59-career starts in the NASCAR Camping World Truck Series.